You can view Safari tabs side-by-side on the iPad, allowing you to view two webpages at the same time on the same screen. 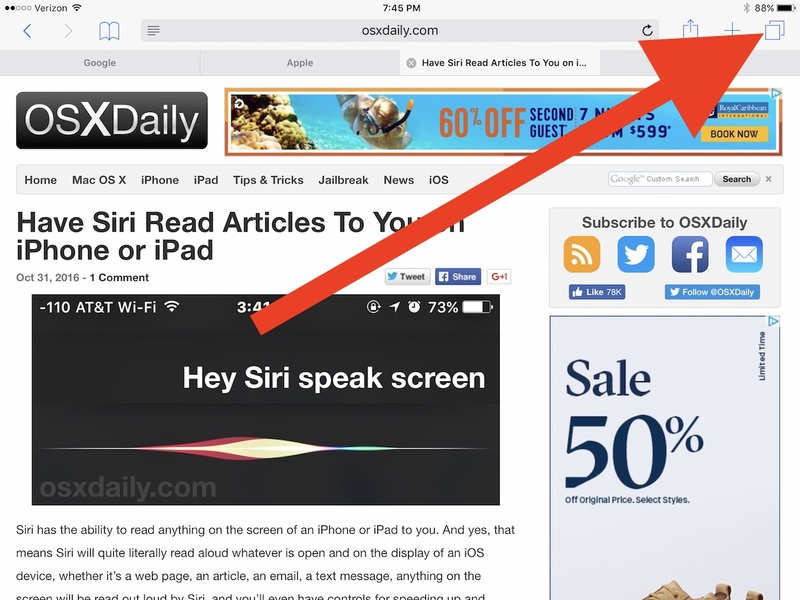 This is a great power user feature and is similar to the general Split View ability for iPad which allows you to view two apps alongside one another, except it’s specific to the Safari browser. Note that using Safari Split View on iPad requires the iPad to be in horizontal mode, Split View Safari will not work in vertical orientation mode. It also requires a modern version of iOS on the iPad, anything beyond 10.0 will have support for Safari Split View, which is a different feature than the broader Split View feature which allows apps to be side-by-side. 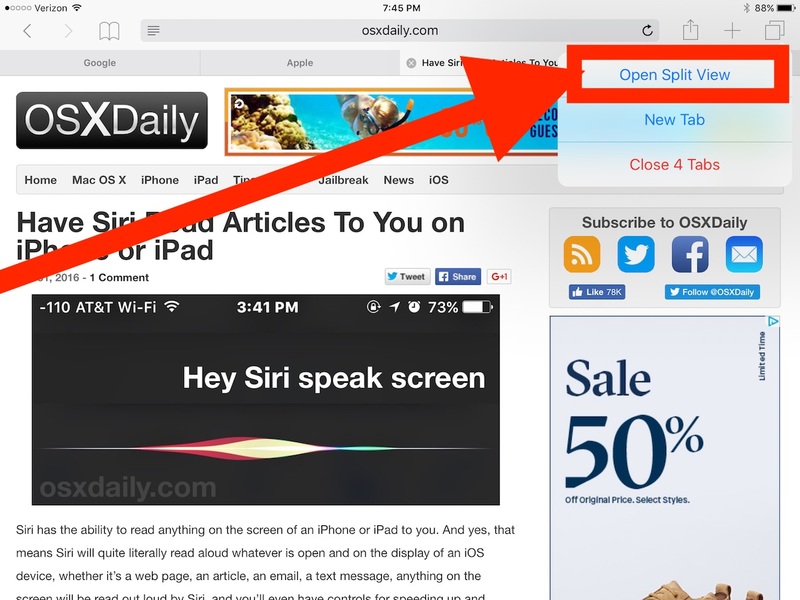 The Safari Split View browser windows can be opened, closed, and scrolled through independently of one another, and also contain separate tabs in each side of the Safari Split View window. 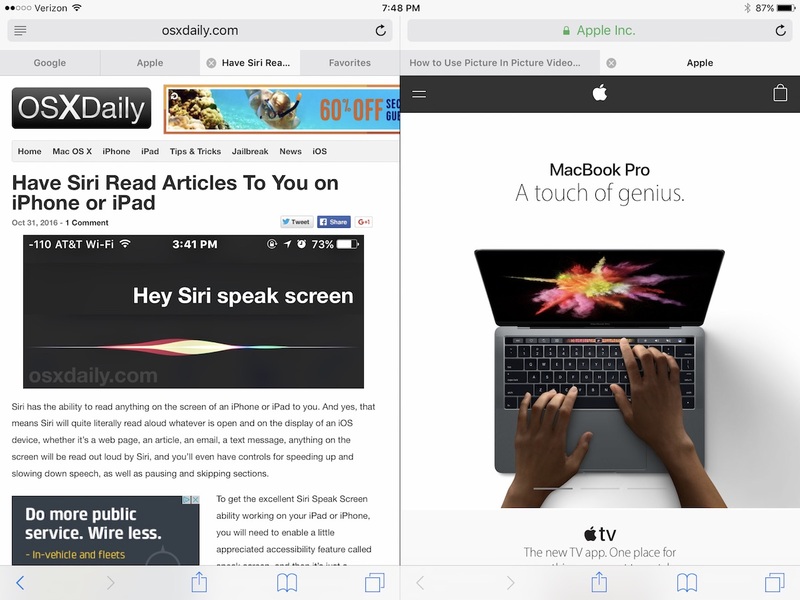 You can also open a webpage into Safari Split View by tapping and holding on a link on iPad, then choosing “Open in Split View”. That will open the link into a new side-by-side Safari browser window, similar to how you can open a new webpage into a new tab. If you enjoyed these features for iPad, you’ll also likely enjoy some of the other more powerful features, including using slide over multitasking on iPad, Split View multitasking, and the iPad Picture in Picture video mode. Split View is an iOS feature that is unique to iPad, and it requires newer hardware versions of iPad with 9.7 or 12.9″ displays, it is not available on iPhone or the Mini. However, Split View capabilities do exist on the Mac as well. Yup you’re right, thanks for catching that. Split View Safari only works on iPad. Split view and Safari split view also has hardware requirements, it won’t work on older iPads. You can use Split View with iPad Pro, iPad Air 2, or iPad mini 4. Why would you want to have two windows on an iPad mini? Do you like squinting? Do you squint when you use an iPhone? Thanks for this last post which explains why I couldn’t get to work, tried many many times, on a iPad 3. You need a new iPad for this feature. Coincidentally it does not work on my Commodore 64 either. Sadly, almost nothing works on my Timex Sinclair 2000.
iCab has a split view mode, and more, that works on older hardware. One of the best two bucks I’ve spent on my iDevices. Why don’t they implement this in OSX in full screen mode. It would be awesome. Its such a pleasure to use on iPad pro. Wow, this is neat! I did not know at all about this, but plan to make use of it now.